Youth follows in our footsteps. If your teen or your younger kids want to shoot or hunt, don't stop them. Encourage them. Work with them and shape them into responsible adults with useful knowledge that they can pass on to their children one day. There's a lot of choice in the youth bow market at the moment. 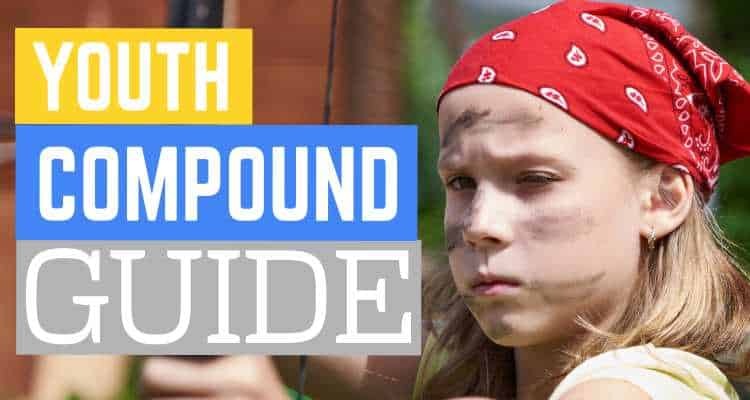 In this article we're going to help you cut through straight to the best youth compound bows available without too much fuss. Note: Our individual reviews are below, but you can also click any of the links above to check current prices on Amazon. Youth Hunter or Youth Target Shooter? Youth Bow Weight, How Heavy? In this article we will cover the mindset, strategy, and options for purchasing a youth bow for a child. Understand that this is a very important decision for the adult and for the child. In many cases you are purchasing a child’s first deadly weapon. First and foremost, each adult must decide when the child is ready. You must trust that they will be responsible with the safe use of the weapon and with care of it as well. Not only are other people’s lives at stake, but this can also be a large financial investment. It is vital that you have a talk with the child and ensure they are ready for this step. You should also take them out with your bow and show them basic safe handling of the weapon such as pointing it downrange, never dry firing, and never walking downrange until other archers are finished. The first decision when selecting a youth bow is how the child will use it. If the child will only be using the bow at home for target practice or for hunting, you can get whichever style you like. However, the vast majority of archery participants are children participating at youth summer camps. These camps often have requirements on what style of bow the child can use. It is vital that the child have the same type of bow at home. If they transfer from a compound bow at home to a recurve or long bow at camp, they will have difficulty with the adjustment. This goes for tournaments and archery schools such as the NASP® as well. The NASP® only uses Genesis zero let-off bows these days, so they shoot more like a recurve. Many youth bows are adjustable to last a child several years, so you should consider their future use as well before selecting a style. The next decision is to determine the eye dominance of the child. To do this, pick a focal point on the wall such as a clock or light switch. Have the child point at the focal point with the tip of the finger on the target. Then have them close their right eye. If their finger appears to stay on the focal point, they are left eye dominant and need a left handed bow. If their finger appears to jump off of the focal point to the side, then they are right eye dominant and need a right handed bow. Unlike many other tasks, with archery eye dominance is more important than left/right hand dominance as the eye needs to look down the string through the sights and at the target. The next thing to consider is the size of the child. My best suggestion is to go to a professional archery shop and let them size the child for the bow. This means you will likely pay more for the bow, but at least you know you are getting one that will fit them. A bow that does not fit well can be unsafe to use and can cause bad habits in form. Your other option is to measure the child and then select a bow on your own. The draw length is the figure you will need. Have the child hold out both arms to their sides. Measure from the tip of the fingers on one hand to the tip of the fingers on the other and divide that figure by 2.5. This will give you the draw length you need to select a bow. On adjustable bows, there will be a range of draw lengths. Pick a bow for which the child’s draw length is on the low side of the range. This will ensure they have room to grow into the bow as their draw length increases. The height of the child will be important as well, but the only way to determine the right bow height is to try them out. Youth bows range from 31 to 41 inches, so pick one that is just slightly too tall for comfort so they can grow into it. Draw weight is the next consideration, and again must be tested out on a bow. For compound bows you can go with a higher draw weight as the let-off reduces the draw weight once at full draw. Recurve and long bows must be completely comfortable for the child to pull to full draw. As a general rule children that are 50 to 70 pounds can normally draw under 15 pounds. Children between 70 and 100 pounds can normally draw 15 to 25 pounds. Children between 100 and 130 pounds can draw up to 40 pounds, and children between 130 and 150 pounds can draw 40 to 50 pounds. This is summarized in the table below. ​These are all weights that need to be tested for each individual. There are a few other factors to consider. The weight of the bow itself is another factor that will be different for each child. You want them to have a bow they can hold steady for at least 10 to 15 seconds at zero draw. Bows can vary greatly in weight, so have them try out several specifically to focus on the strain on their straight arm. The back wall of the bow is how defined or undefined the maximum draw for the bow feels. A hard back wall creates more accuracy, while a soft back wall allows for the straight arm to grow as the child gets older. Also consider the color and pattern on the bow. You can get solid colors or a camo pattern. Camo works best for hunting, but many archers choose a solid color they like for competition shooting. Finally, consider the cam shape. Each cam shape will create a different amount of let-off when at full draw. Try out a few to determine which feels best for the child. As for safety gear, there are several items to consider. Almost all archers use an arm guard on their straight arm to prevent the string from slapping their arm when released. This can do a great deal of damage to the skin. Youth will also need either a glove or tab on their draw hand to give them more grip and protect the skin on their fingers. Aside from these items, you may want to consider a chest shield to protect against bowstring slap and to hold loose clothing in place. You can also buy a wrist sling to prevent a child from dropping the bow or a rubber safety to hold the arrow on the rest until they are ready to draw. Barnett are a well known name in the crossbow world. They make a great range of Recruit crossbows suitable for youth users. This banshee bow is the compound introductory equivalent. This is an entry level bow for small children and comes in a range of colors for both girls and boys. The specs read as follows. You can use this either left or right handed and you get everything you need (with the exception of a good target) in the package to get your youngster started. The bow has a pin sight, finger savers to stop blisters and callouses and make drawing the string more comfortable for young fingers. There's also 2 included arrows. However these aren't the best quality, they're plastic and will likely break after a bit of use. The packaging this bow is supplied with also doubles as a makeshift carry case. Again this won't last any great length of time and won't stand up-to any abuse, it doesn't enclose the bow, but it's a handy way of storing and carrying in the beginning. The Crosman (manufacturer name) Elkhorn (city in Wisconsin) comes in a more complete package than any other bow in this lineup. The major downside is for lefties, this is a right handed bow only. In the package you get a bow that is designed to mimic the look and feel of a full scale adult hunters bow. This is something that 9 - 13 years olds will appreciate. You aren't giving them something that looks like a toy, this looks and feels a little more like a real adult compound. There's an adjustable pin sight and 2 piece quiver in the package. You also get a finger tab, arm guard and 2 arrows. Bear Archery are a well known and respected archery make. They make legendary recurve bows such as the Grizzly through a long-standing traditional process. They're been around for years and this youth offering hits the sweet spot when it comes to compound bows. Although it's slightly more expensive than others, the benefit of this compound to other youth compounds is the supply of a whisker biscuit arrow rest. That's a full capture rest, once rested the arrow won't move or fall out even if the bow is lowered or moved around rapidly. That's a great addition for children, you can nock and load-up an arrow and distractions won't curtail the shot being ready. ​This youth compound really does mirror the adult world. It has a skeletonized riser, 2 piece quiver, composite limbs with limb pockets, apart from only being 26" ATA, at a glance you'd think this was a miniature adult bow. It's available in a range of colors for boys and girls and even camo for junior hunters. I hope this roundup was useful and led you in the direction of a quality target for your setup. Please let us know if we're missing your favorite and need to add it to this review, or if there​ are any aspects of any of the above we've not covered correctly! Either leave a comment or send us some feedback!